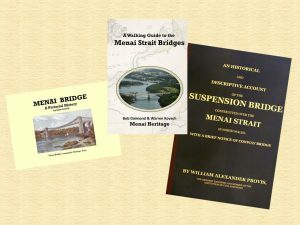 Menai Heritage sell a range of books, engravings, T-shirts and other items related to the bridges. We are now selling some of them online. All items are also available from our exhibition during opening hours. 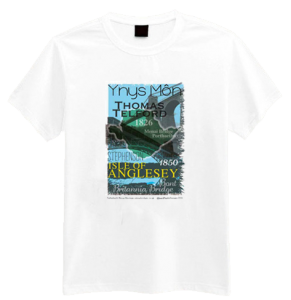 Click on the images below to go to the sections of our online shop. 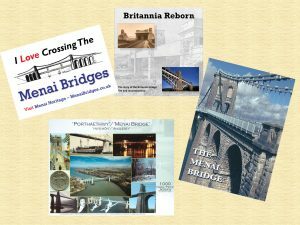 The books available include our new walking guide to the bridges, as well as a pictorial history to Menai Bridge town. We also have a facsimile edition of William Alexander Provis’ 1828 book exploring the planning and construction of the Menai Suspension Bridge. 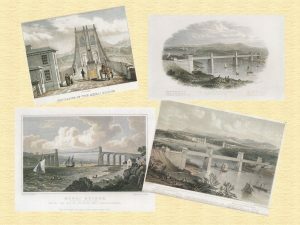 We have a large number of antique engravings of the bridges in our collections. We have now made reproductions of the most attractive of them, which are printed and ready for mounting and framing. 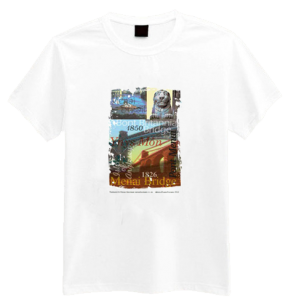 Our custom-designed t-shirts, produced specially for us. We also have a number of other items available, including car stickers, fridge magnets, DVDs and jigsaw puzzles. We also have bridge-related memorabilia, prints, and books available for purchase at the Telford Centre.